Treasury Secretary of Fight Club? Whenever stories mention the name of Henry Paulson, the current U.S. Treasury Secretary who is begging Congress to bail out our free market, I can't help but thing of Meat Loaf in the film Fight Club. I am fully aware that they are not at all related and that Robert Paulson is, indeed, a character of fiction from the mind if Chuck Palahniuk, but I can't shake the link in my mind. It really makes me wonder. No matter what happens as a result of our current financial crisis, will we remember the Treasury Secretary at the reigns of our economy with the mantra, "His name was Henry Paulson?" His name was Henry Paulson. His name was Henry Paulson. His name was Henry Paulson. 1. Football--this wonderful autumnal game completely diverts me from anything truly productive and I'm sure that my grades suffer as a result but I don't even come close to caring. 2. Weather--along with the leaves changing (which is beautiful in Pennsyltucky), the fall brings cooler, crisper weather and an outdoorsy scent that is simply indescribable, but wonderful. 3. Halloween--is Jenna's favorite holiday and it's a good time for all. I particularly like it when it falls on a weekend and this year it's on a Friday so hooray! What could be better than dressing up and acting like something/someone else and eating way too much candy? 4. Thanksgiving--it may very well be my favorite holiday. It combines all the good things of Fall plus wonderful food. Last year we hosted a Thanksgiving feast and we're doing it again this year. I do love a good turkey. 5. Autumn--this is one of my favorite words. Words that end in -mn are wonderful to me. It is even better in the phrase 'autumnal equinox." That list is in honor of the autumnal equinox that occurs at 11:44 EST today, September 22. Enjoy this most wonderful of seasons and take a few extra steps to crunch a particularly crispy-looking fallen leaf this year. The more I read other blogs, the more I wish I had chosen Wordpress as the host for this blog. It is fully possible that I am under utilizing blogspot, but it seems that all of the sites on Wordpress are much more full and easier to navigate. I don't particularly want to switch (unless Wordpress made it ridiculously easy to transfer the posts from place to place), but I desire more from the format! If you happen to know how to make a snappier blog, do let me know. Today, in addition to being my beautiful, wonderful mother's birthday, is International Talk Like a Pirate Day all across the globe. My first experience was ITLAPD was during my freshman year of college. Some fantastic Arizonians (one of whom I married) worked tirelessly to plaster campus with signs encouraging their classmates, peers, and professors to let go of their prejudice regarding the less-then-auspicious history of piracy and embrace the beauty that is the native parole of the sea-faring ilk. I implore you to, if nothing else, give it a shot. At the least, trying to talk like a pirate will afford you a sense of ease in your own native tongue. I never appreciate ASE more than just after trying to converse in another language, or even in an unfamiliar dialect. In other news, I have finally started to use Twitter. I had resisted for a time but I eventually caved and I have a feeling that it may be difficult to stop. If you have used Twitter, how do you feel about it? 'Ave a good tide shipmates! Arrgh. I realize that it is fairly far off, but I am thoroughly excited for Thanksgiving Day. Last year, we hosted a small gathering of friends that were unable to get to their respective homes for the holiday. In my mind, though, Thanksgiving is more of a friend holiday than a family get together. Take, for example, the seemingly endless number of Friends episodes set on or around Thanksgiving Day. The show isn't called Friends for nothing. While I do enjoy the football, camaraderie, and convivial conversation my favorite part of the whole day is the food. Now, more than ever, I really enjoy cooking Thanksgiving dinner. Last year I got to cook a turkey (thanks How To Cook A Thanksgiving Turkey Dot Com), mashed potatoes, a cheesecake (thanks Mom), and other succulent things. This year, I hope to do the same and maybe more. I doubt our feast will look like the pictured spread--for one, it is apparently dangerous to stuff the turkey because germs totally lurk in the breading--but I won't mind too much. I really enjoy sitting around a table with friends with well filled bellies enjoying the friendships we are blessed with. If you've nothing better to do on November 27th, give us a call and join the festivities. ps- It's incredible to me that www.howtocookathanksgivingturkey.com actually exists. What's more incredible is that cooking a turkey is fantastically easy. Ever since Thanksgiving Day last year we've wanted to, on a whim, purchase a turkey, cook it, and feast for weeks on the left overs. The aforementioned Web site (is that the correct way to write that?) gives a very easy turkey cooking process that is very work-free. Anything that is delicious and incredibly easy is okay by me. 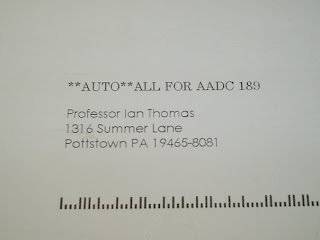 It would appear the lovely people at Bard College in Annandale-on-Hudson, New York have dubbed me a professor. Who needs to complete advanced degrees and actually hired? Not this guy. Really, all I can figure is that since I recently joined the MLA (as a student, mind you) it is assumed that I am on the other end of the education spectrum. Needless to say, this new title delighted me and quickly founds its way to my facebook profile picture. I suppose I should get back to this paper about Granny Weatherall so that I may be able to be a professor in the real world, not just in the imaginary land of Bard College. ps--I realize I should probably be less cavalier about posting my address on the internet but I'm not. Last night I, like 38.9 million others, sat down and watched McCain accept the RNC's nomination for president. While I was watching, I had the good fortune of live-blogging with mostly like-minded people so that added to the entertainment. I didn't expect a very great speech from McCain and he didn't deliver one. I think it's fair to say that he's not a terribly gifted speaker but that shouldn't disqualify someone from being a president. For me, it's all about policy and issues. Luckily for me, this election cycle has been fairly because, almost across the board, I disagree with what McCain is pushing. Along with his positions on the issues, I have a lot of difficulty imagining that he is genuine in some--if not most--of what he says. According to Neilsen, McCain's speech was watched by a half-million more people than Obama's. While this was a little disappointing for me initially, I can't help but thinking that this is a good thing. It is my hope that to more people are able to compare McCain and Obama, the Senator from Arizona will look worse. Try as I may, I cannot help but gobble up the news about Sarah Palin. I never would have thought 'political' news could be so much like watching The View while snacking on unbaked-but-oh-so-delicious cookie dough.